It is hard not to know what Chuan’r is to those who live or have lived in China. However, most people would be surprised to know that chuan’r did not become popular–China wide– as a street food item until recently. In fact, the history of Chuan’r is even more complicated than that. We will try to untangle the history of chuan’r; understand what it has become and put the theories of its origins into perspective. Our goal for the readers is to have a clearer understanding of the how chuan’r represents how societies interact . 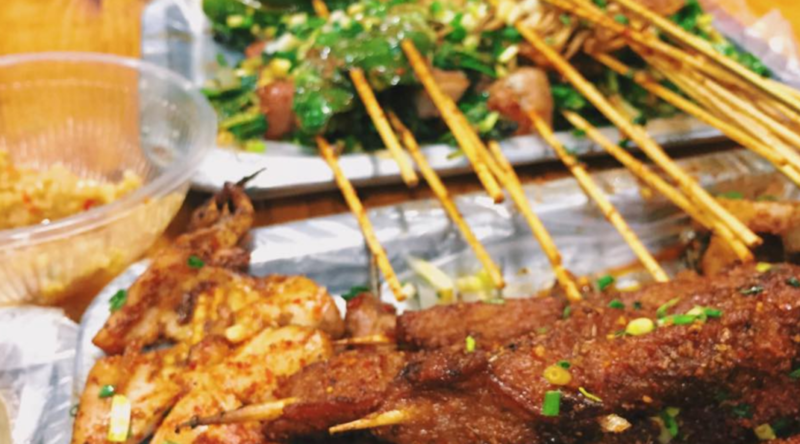 The quintessential Chinese street food, chuan’r, are small pieces of food on a skewer placed on a grill heated by burning coal–Note that I say food, not meat, because of the myriad types of skewered edibles we can find nowadays in China. The apparent father of all chuan’r is lamb chuan’r (Or Yang Rou 羊肉 for the more experienced). It has a spicy, crispy, fatty flavor–It’s making my mouth water as I write about it. The recipe for the lamb chuan’r is rather simple (which reinforces its popularity): grind cumin, chili flakes, and mix with salt and pepper. Heat coal and place it under the grill, cut squares of lamb and mix with the spices. Tangle the meat cubes on a stick and place them over the grill. This supposedly traditional chuan’r is still the most popular and well know. However, today, vendors have become creative in their offerings of skewered spiced meat. The varieties range from the traditional–The lady outside of the JinQiaoLu subway stop selling lamb chuan’r on a pita bread–all the way to the new and innovative –Qibao Old Street where you can find sparrow skewers, or Yunnan South Road, where you find all types of vegetables ready to be grilled. This new idea that anything can be chuan’r and chuan’r is a way of cooking more than a dish is epitomized by Long Long Ago… A restaurant based around the idea of street food. When I was first introduced to LLA, I was weary–thinking it was nothing more that people overcharging for street food with no extra add ons. But let me tell you, I was wrong. The full name is “ Long Long Time Ago We Were Just Street Vendors”. As its name implies, it was created by a former vendor turned entrepreneur. SJ(宋吉) started LLA in Beijing. At the very beginning, he had no money to start his own business so he decided to work as everyone else and save money. He was frugal, but after years of saving, he finally got enough for a street food stand of his own. His stand became a popular destination for young people. With his entrepreneurial mindset he came up with the idea of a restaurant based on street food. He finally managed to save enough to open the restaurant. After enjoying success in Beijing, he managed to move forward and open a branch in Shanghai on Yunnan South Road. While at the restaurant, we sat down and decided to eat–luckily enough one of us was Chinese and thus ordering was not as big of an ordeal as in other occasions. Our first impression was that the restaurant was designed for groups. We were sat on stalls that had a center grill open to both sides. Apparently letting customers cook for themselves is part of the charm. Once we ordered–we had lamb and beef chuan’r– we placed the skewers on the grill, and to my surprise, the grills are high tech. They rotate automatically. In our opinion this removes the necessity for constant supervision of the food and allows everyone to have conversations. When the restaurant first opened, the only sold beef and lamb chuan’r, but now they have a myriad of ingredients that can be threaded onto a skewer and spiced up. The beef and lamb chuan’r were referred to as the original chuan’r. I recall someone noting that chuan’r came from the west of China, and that because of the muslim influence, the people used Lamb. We were set to find out what was the original Chuan’r. According to many, Chuan’r is a dish from western China. And they are, perhaps, not wrong. Chuan’r as we know it–crispy, spicy, fatty– the lamb skewers were first prepared by the Uyghur minority in Xinjiang, Western China. The Uyghur, have been influenced by middle eastern culture, and it could be infact said they are more middle eastern than chinese. The New York Times quotes Yidilisi Abuduresula, a Uyghur archeologist in xinjiang, saying “It’s historically been a place where cultures have mixed together.” The Uyghurs are also turkic people. Due to the history of the region being the center for the silk road, there have been many excavations and archeological sites. In 1985, at archaeological site in Qiemo County, archeologists found proof that the Uyghurs had roasted meat on skewers as early as the 11th century. “The Divanu Lughat-it Turk (Encyclopedia of Turkic Ethnic Group Languages), written by Mahmud Kashgari in the 11th century, also documents the consumption of roasted meat: it contains the words “enliqi” (a garlicky spice used particularly on roasted meat), “takelidi” (a verb meaning “to pierce meat with a stick”), and “suigulunchu” (a verb meaning “to roast meat in a pit”, as is the famous Uyghur roasted lamb).” According to the cooking methods described in this book, it would be safe to assume that the chuan’r is a derivative of kebabs, a traditional turkish cuisine. In my hometown of Medellin, without ever having been to Asia and by only contact to Chinese food was at NY’s Chinatown (Not a great representation of asian food), I remember eating chuzos. To those who don’t know, chuzos are astoundingly similar to chuan’r–and therefore kebabs.They are marinated cubes of meat mixed with onions and peppers, placed on a skewer and barbecued. They are usually served with arepa ( a round bread-looking maize dough). As you can see from the photo below, the resemblance is uncanny. You can then, imagine my surprise when I first arrive to China and saw chuan’r. 15 thousand kilometers away and completely different cuisines, yet this two “traditional” dishes were astoundingly similar. Colombian Churro–Yes, I know what you’re thinking. It looks good. It turns out that Colombian chuzos and Chuan’r are not the only two kebab-looking dishes connecting two cuisines with no other apparent similarity (I used kebab as reference because I believe it is the most known dish, not as an acknowledgement as ancestor of all barbecued skewered meat). The French brochette, Spanish pincho, Japanese yakitori, and the south east asian satay all reflect the same similarity. In France, en brochettes refers to all the food cooked on skewers. There is not specific recipe, but as all french things are, the term is only reserved for things done in France. In the case of Spain, it becomes a little more interesting. Spain, like Xinjiang, has also been influenced by muslim and middle eastern culture. According to the newspaper El Correo, the spanish believe that the pinchito came fromt muslim societies, and they go further to state that kebabs came to be because in muslim cultures knives are not used at the dinner table–the reasoning was that they could be perceived as a weapon and that the dinner table was a place for harmony. Traditional recipe is made with cumin, black grounded pepper, ginger, sweet pepper, turmeric, and saffron. As you may see, the spices are very similar to those of chuan’r. Going back to Asia, we have the japanese yakitori. The Japanese yakitori as chicken skewers served with a sweet soy-based sauce. The earliest recordings of yakitori date it back to the 17th century. The 17th century period in Japan, called Edo, was characterized by economic growth and isolationist policies. During this period, the dutch (through the Dutch East India Company) were the only with constant contact with the Japanese. Finally we arrive at south east asia. Here chuan’r are known as satays. Indonesia, Malaysia, Thailand, and Singapore all have their own versions of satay and all claim to have the original satay. 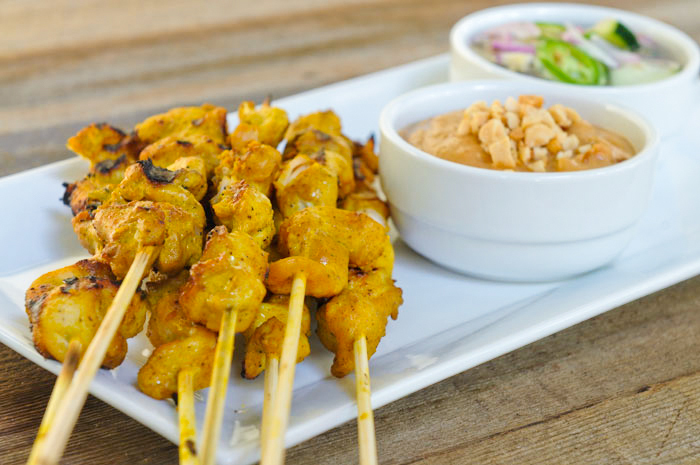 Indonesian satay is known for their peanut sauce; thai satay has turmeric as its main spice; Malay satay (also known as chicken satay) is also made with turmeric and served with a peanut sauce; Singaporean satay has both turmeric and cumin as its base spice. Overall, all of these dishes have a middle eastern influence or were influenced by cuisine previously influenced by the middle east. At this point it would be easy to conclude and say that the shish kebabs are, in fact, the original skewered meat. But we have found evidence stating that maybe, it is not. The origins of chuanr may come from the unlikeliest of places. Homer’s Iliad is said to mentions preparing meat by roasting it on skewers (maybe now would be the the time to let you know that Shish means sword or skewer in turkish and kebab means grilled in persian). Homer states, “and cut out the thighs and covered them  with a double layer of fat, and laid raw flesh thereon. And the old man burned them on stakes of wood, and made libation over them of gleaming wine; and beside him the young men held in their hands the five-pronged forks” (Hom. Il. 1.465). It can be theorized that the kebabs were not a turkish creating but were taken from the greek. This would actually makes sense if you think about the fact that turkish territory was once greek. Settlements of greeks in Anatolia have been found as early as the 20th century. Perhaps it would be harder to trace the influence of the greeks down to South America where skewered barbecued meat is also common. The most likely explanation is that the food arrived with european settlers. The word churrasco (Brazilian skewered barbecue) can be traced to Churrasco Moçambicano, the word used by portuguese colonies to describe a dish from Mozambique. The evidence that traces the history of Chuan’r back Ancient Greece is substantial. But it is all theoretical. It could be equally likely that all is just a spurious correlation. That the reason to why chuan’r is found around the world could be simply because placing meat on a stick is logical way to cook meat. However, what we did learn is that chuan’r and its many variations have been around for a very long time, and the spread around the world means that just like chuan’r is now part of chinese culture, other skewered dishes are also part of the cultures of their respective countries. Andalucian Pinchitos Morunos. Digital image. Culinary Anthropologist. N.p., 10 Aug. 2010. Web. 12 May 2016. <http://www.culinaryanthropologist.org/andalucian-pinchitos-morunos/>. Chuzos Colombianos. Digital image. Sweet Y Salado. N.p., 26 June 2015. Web. <http://www.sweetysalado.com/2015/06/chuzos-de-carne-colombianos.html>. Eguia, Sergio. “La Receta Original (y Secreta) De Los Pinchos Morunos Caseros.” Elcorreo.com. El Correo, 22 Jan. 2014. Web. 12 May 2016. Homer, Robert Fagles, and Bernard Knox. “1465.” The Iliad. New York, NY, U.S.A.: Viking, 1990. N. pag. Web. [Eng Sub]羊肉串 Chinese Lamb Skewers BBQ Recipe. Dir. Amanda Tastes. Youtube. N.p., 1 May 2014. Web. <https://www.youtube.com/watch?v=_2sx09DUiJ0&gt;. “Japan Memoirs of a Secret Empire.” PBS. PBS, n.d. Web. 12 May 2016. <http://www.pbs.org/empires/japan/timeline_1800.html>. Malay Satay. Digital image. World Integrative Medicine Academy. N.p., n.d. Web. 12 May 2016. <http://worldtraditionalmedicine.org/The-Journey-to-promote-the-Gastronomic-Value-around-the-world-Top-Malaysia-Cuisine_c45_d80.htm>. Men Barbecue. Digital image. Jiaren (佳人）. N.p., 15 May 2015. Web. 12 May 2016. <jiaren.org/2015/05/15/kaochuan>. Roebuck, Carl. The World of Ancient times. New York: C. Scribner Sons, 1966. Web. Sarah. “Street Food Adventures in Xi’An – The Woks of Life.” The Woks of Life. N.p., 22 May 2014. Web. 12 May 2016. Thefoodsnobuk. Indonesian Satay. Digital image. Thefoodsnobuk. N.p., 6 Jan. 2013. Web. 12 May 2016. 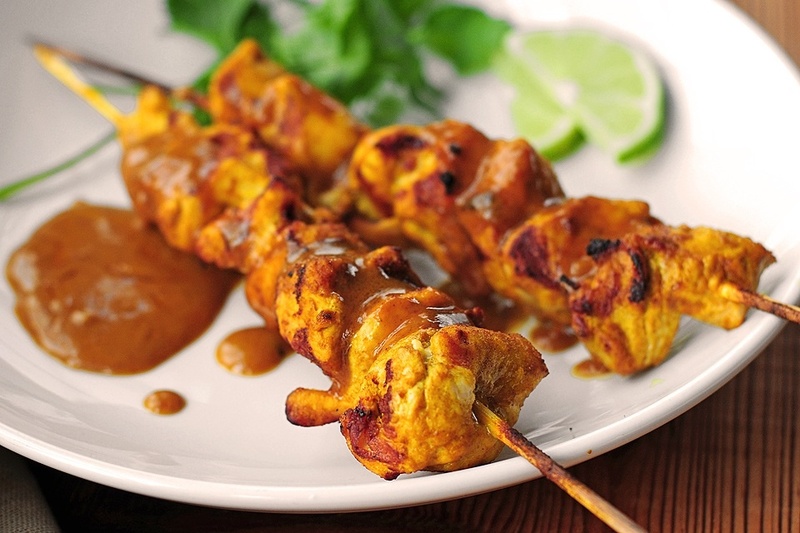 <https://thefoodsnobuk.wordpress.com/2013/01/06/indonesian-chicken-satay-my-style/>. Yakitori. Digital image. Just One Cookbook. N.p., 13 Apr. 2014. Web. 12 May 2016. <http://www.justonecookbook.com/yakitori/>. “Yang Rou Chuan (Spicy Lamb Kebabs).” Yang Rou Chuan (spicy Lamb Kebabs) Recipe. N.p., 26 May 2010. Web. 11 May 2016. Wong, Edward. “The Dead Tell a Tale China Doesn’t Care to Listen To.” The New York Times. The New York Times, 18 Nov. 2008. Web. 12 May 2016.